Without getting into too many details, but wanting to share the feel of some stressful events, this is about what happened… The whole morning, Mark and I ran around, investigating all the mentioned and non-mentioned hotels in Rock Sound. We checked the map, followed signs, asked around, stumbled across information, only to find out that of the four accommodation options, one didn’t exist, one only did monthly rentals, one was full, and the last one was a resort, 2 miles away from town (and from the boat). None of the public phones worked and at one point half of the village was trying to find a room for us. A police officer got in touch with a grocery store owner and by early afternoon, we had a nice room booked in a just starting (that day?) and unfinished Bed & Breakfast place, one mile from town. Then, we had to do some grocery shopping for four people for over a week, and try to find a place to store it all. Everything got soaking wet on the dinghy ride back, because of the strong winds. After that, we wanted to move the boat to the southern part of the harbour. It was already 3 pm. We motored all the way there, tried to set the anchor, and failed. We tried again, but at 4 pm, we wisely decided to go back to our previous spot near town, now half an hour away. Oh, and while we tried to anchor in the “new” spot, we forgot all about our dinghy we were towing. Something we only do for short distances and something we are not very used to. So, we forgot to pull it in a little closer. Manoeuvring back and forward during the unsuccessful anchoring process, we ran over the line, which – of course – got stuck around the propeller, which in turn, switched the engine off. While the anchor was dragging, I jumped in the water with a mask and managed to unwrap the line. Luckily, nothing serious seemed to have broken. The four of us (and the dogs) spent another full day in Rock Sound, exploring the sights (town, the blue hole, and the beach), eating at the fair, and sweating a lot. 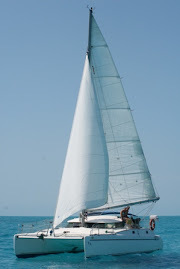 Since this wasn’t really a great place for us and our visitors to stay for a while, my parents moved in with us and we sailed Irie to Cape Eleuthera Marina. The idea of staying in a “fancy” marina, psyched everybody. It wouldn’t be cheap, but just being able to take decent showers, use normal restrooms, take a swim in the pool, jump off the boat onto a dock, not worry about the anchor in the heavy winds, stock up with water, do some internet, and walk along the beaches, sounded great. Big was our disappointment, when we checked in. The people weren’t helpful or friendly at all, there was no pool and no wireless internet, showers cost an extra $4 per person for five minutes (forget that! ), and brackish water out of the tap cost 45 cents a gallon! We really needed to fill up, though, and after some complaining, we found out the water system was broken and the tap water was undrinkable. We pushed a little more and were finally able to get enough (twelve) “older” five gallon jugs of good water to mostly fill up our water tank. To do that, we had to siphon the water out of the jugs into our tank.